The Walking Dead #103 marks a huge turning point in Robert Kirkman and Charlie Adlard’s nightmarish vision of the Zombie apocalypse. It might come as no surprise that after 100 issues of non stop tragedy and suffering, Rick Grimes has apparently lost the will to fight – at least that what he wants everyone to believe. His group have suffered some terrible personal losses, but his decision to allow Negan and his men access to their camp and medical supplies has already begun to alienate him the rest of the group. Rick knows that he will have to play along with Negan’s demands, at least for now, even though it may well cost him the support of his friends and the trust of his own son. The air of brooding menace that hangs over the events of this issue really helps to ramp up the tension. Negan is a fantastic new adversary for Rick and his group. We all know the horror and brutality this man is capable of, so when Rick allows him into the camp, the way Negan swaggers around and taunts everyone is deeply unsettling. Negan presses home Rick’s humiliation by making him carry the baseball bat wrapped in barbed wire (Lucille) that he used to kill Glenn, taking it back from him at the end of the issue with smug satisfaction. 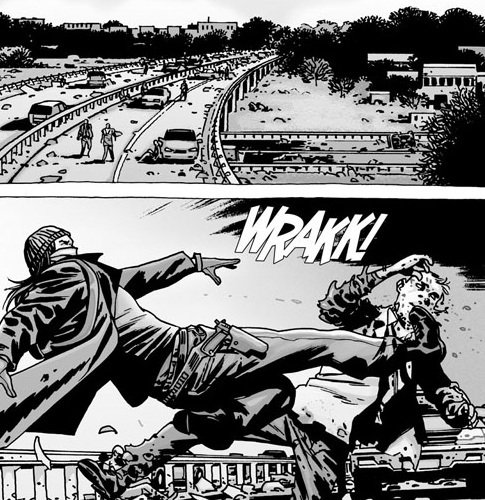 Charlie Adlard’s art on this issue really comes to the fore in the opening moments, as Jesus follows Dwight along the highway, doing his best to say out of sight and out of the reach of some hungry Walkers! This is one of those wordless scenes that Adlard does so well, drawing us slowly into the scene, the deserted roads adding to the feeling of isolation and desolation of this quite world of creeping death. 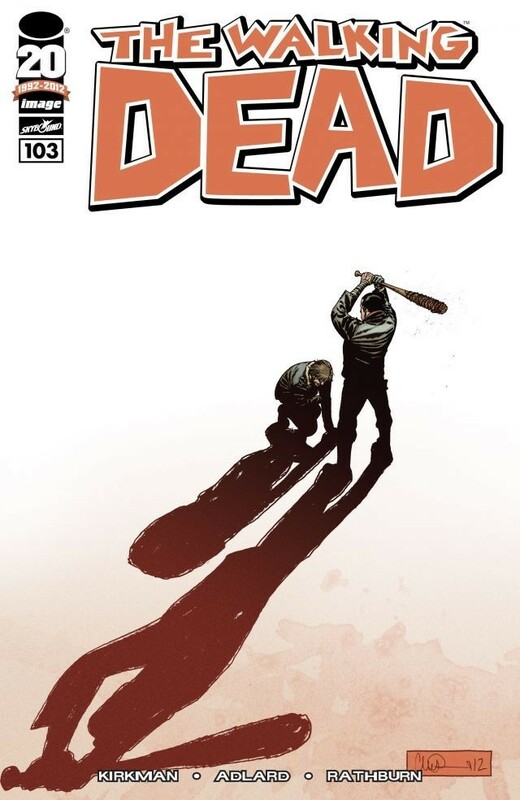 The Walking Dead #103 is the perfect jumping on point for new readers of Robert Kirkman’s visceral saga. This series continues to go from strength to strength, constantly finding new way to keep Rick and his desperate band of survivors on their guard. You never know if everyone will make it out alive, no one is ever truly safe, and now Rick is about to take the most dangerous gamble of all as he attempts to outwit Negan and the marauding Saviors.